Introduction: We first broke news of the new Classic baits offered by Berkley at the end of last year and since then we have obtained both more detailed information as well as the baits themselves for a more in depth look. 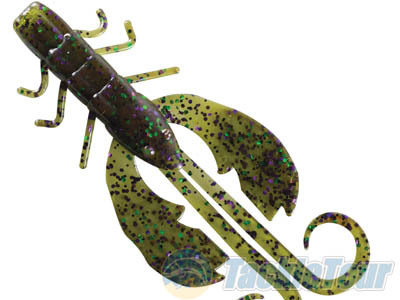 PowerBait 3-inch Crazy Legs Chigger Craw: First came the Chigger Craw, then the following year Berkley added the "Crazy Legs" to the original Chigger Craws which made it an even deadlier plastic against both active and non-active bass. This past weekend I was fishing with Cal on Lake Camanche in Northern California for Spotted Bass but I only had the 4 inch Crazy Legs Chigger Craw. It was a tad too large for the application and the smaller 3 inch would have been ideal. 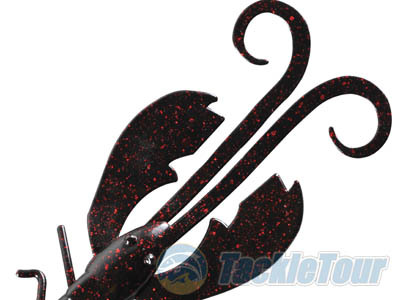 Like the 4 inch version, the new Berkley PowerBait 3 inch Crazy Legs Chigger Craw is identical in design except the smaller bait is designed for finesse applications. This version can be rigged Texas style, Carolina rigged, used as a trailer or even pinned on a smaller jig head for those less active winter bass. 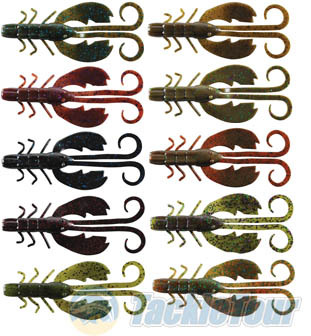 Available in 10 fish-catching colors; Black Blue Fleck, Black Red Fleck, Breen, Cinnamon Purple Fleck, Green Pumpkin, Green Pumpkin Blue Fleck, Green Pumpkin Party, Pumpkin Green Fleck, Watermelon and Watermelon Candy, the PowerBait Crazy Legs Chigger Craw features high-action pincers that create more action on the fall. The crazy legs swim with fast or slow movement and even flutter during a pause in the retrieve. MSRP for this new finesse bait is $3.99 per package, which contains six Crazy Legs Chigger Craws. 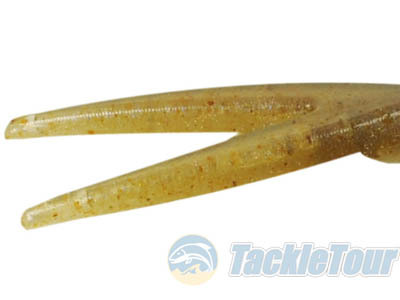 PowerBait Power Minnow: It has been a very cold winter in many parts of the country and Berkley is introducing another finesse bait for these days when the bite can be tough. The Power Minnows were discontinued a few seasons back and a lot of avid anglers continued to express desire for these lures so the company is bringing them back. 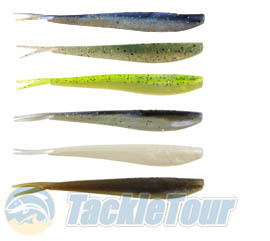 The PowerBait Power Minnow will be available in 2, 3, and 4 inch sizes. The unique split tail design of the Power Minnow provides a subtle, finesse presentation. For the best results, use the PowerBait� Power Minnow in any situation where bass have a case of winter lockjaw. One especially effective set up for this soft plastic is rigged on a drop shot rig. Berkley PowerBait Power Minnows are available in six proven colors; Black Shad, Chartreuse Shad, Emerald Shiner, Pearl White, Rainbow and Smelt. A package of Berkley PowerBait Power Minnows bear an MSRP of $3.99. Conclusion: The 2010 Bassmaster Classic is just weeks away and we know a number of pros that plan to utilize these two baits during the tournament, especially if the fish are finicky and finesse techniques can help boat a bag limit. 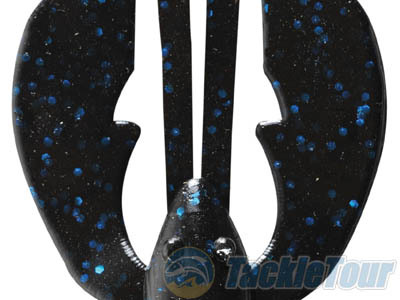 The 3-inch Crazy Legs Chigger Craw we all know will be a big hit even before we get to fish them simply because of the success of the larger 4 inch bait which sports the exact same design, just with a bigger profile. There are finesse situations where a smaller bait can make all the difference. I don't know about you but my start of 2010 hasn't all been that great yet, sure I've landed fish but certainly nothing to write home about. I'm hoping to toss these new baits in my next few trips out on the water and get into those Winter quality of fish I have been searching for.